As we, once again, approach MLK Day here in the U.S. you expect to see headlines like this January 17th Tweet Header from the PEWResearch Center in Washington DC: “On MLK Day, racial equality found wanting.” Yet, in 2014, there is less racism in the U.S. than there ever was. You’d never realize that from reading the “main stream media” but I believe every American knows, in their heart, this is true! FACT: Leftist media and race baiters rhetoric to the contrary, all whites are not racists and all blacks are not victims. FACT: Generally speaking, all Americans are too busy earning a living, negotiating government red tape, avoiding being taxed into poverty, or rooting for their favorite (totally integrated) sports team to spend hours absorbed in racial drama. That said, there are and always will be some Americans who ARE racist and who DO “spend hours absorbed in racial drama” and there are and always will be some blacks who feel that white people ARE to blame for everything wrong in their lives. Another fact is: We, blacks and whites alike, live in a free country where we are free to think anything we want, even if it is total illusion. There are, of course, legal limits to actions based on our illusions. 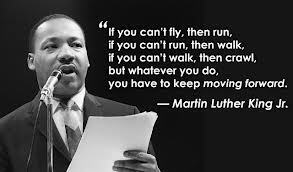 In the beginning, Martin Luther King’s “Dream” was just wishful thinking and if he were aware of the United States in 2014 he would certainly be joyful about the progress we have made as a society and as individuals toward making his dream a reality. Every day in modern America whites and blacks coexist peacefully, work side by side, share rides to and from work, sit down together for dinner and drinks after work, date and even fall in love and marry without worrying about the VERY FEW racists who will attempt to make their lives a living hell for offending their illusionary sensibilities. Don’t forget that racial tensions sell newspapers and earn race baiters speakers fees. In those same years where we have made progress in racial harmony and equality, vestiges of racial inequality have gone from being a sad reality to becoming an industry. Those who profit from that industry by lying and/or exaggerating should not be believed but should be recognized as enemies of American society. I’ve for years enjoyed listening to Mark Davis radio talk show (in spite of his occasional ‘moral’ rants). He’s for the most part intelligent and reasonable and he always seems to come up with his own unique perspective on the topic of the moment. This morning was no different until he said something just after 10:30 am that ‘shifted my brain gears’ and actually caused me to wince at what he appeared to admit to his large radio audience. Before the previous ‘break’ in his show he had a long and interesting conversation with journalist Mark Lewis. One of the last topics in this conversation was Evolution vs. Creationism. Mr. Lewis brought an interesting perspective to the conversation by introducing a famous quote that suggested that evolution was a part of the process of “God’s Plan;” sort of a tool used to facilitate the evolution of man. I was actually surprised when Mark Davis, usually a logical thoughtful man, rejected outright the thought that evolution had anything to do with the creation of man — wouldn’t even consider it a remote possibility. It’s a much debated subject of course and many people have hard and fast opinions on the topic and today we learned where Mark Davis stands. If he only just “stood” there. As I think back on his other personal asides I realized that Mark Davis is, as I said previously, intelligent and reasonable . . . about almost EVERY OTHER topic but religion. It’s like when it comes to God, Jesus, the Bible, Creationism and a proper moral perspective to all of life’s quandaries, HE KNOWS the answers. You may never even get an “In my view” from him on these subjects (as you always get from the title of this blog); just his opinions stated as absolute, unimpeachable fact. That is, at least, the way it is presented. I’m a life-long atheist but I never claim that I KNOW the true facts, (I just suggest that those who disagree with me are being illogical or irrational . . .). I never, however, feel insulted. The bottom line is, I love the guy (in an appropriate sense) and I’m giving Mark Davis the benefit of the doubt by assuming he just made an inappropriate word choice.